LoyLaoShi.com is a Chinese Tuition service run by full time experienced Chinese tutors, with more than 20 years of teaching experience in O Level Chinese (CL) and Higher Chinese (HCL) in Raffles Girls’ School (Secondary). Getting a good Chinese tutor has a direct impact on your O Level Chinese and Higher Chinese exams results. We all know that students in Singapore need to study their Mother Tongue Language or Higher Mother Tongue Language, and most are required to sit for the national examination, PSLE and GCE O Level. Due to the language environment in Singapore, many of our students are facing great challenge in learning their Mother Tongue and Higher Mother Tongue subjects. Chinese students in Singapore will need to sit for the GCE O Level CL or HCL at the end of their 4 years of secondary school education. For the same reason, many Chinese students are having great challenge in learning Chinese Language (CL) and Higher Chinese Language (HCL) subjects. As they do not read nor speak Chinese in their daily life (it’s not surprised that many may not even speak Chinese during Chinese lessons! ), thus they find it really challenging to do well in the subjects. As Chinese language educators, we hope that our younger generations are inculcate with Chinese culture and values, and they will fall in love with the Chinese language eventually. These are beautiful dreams, and we believe it will come true one day. There is a Chinese Idiom “三岁定终身”, meaning that children’s learning is at their peak before the age of three, Studies has shown that, the development of a child’s brain reaches 80% by the age of 3. Hence, immerse a child in the Chinese speaking environment since young age will help the child’s learning and understanding of Chinese in a positive way. However, given the language environment in Singapore, and the fact that our Chinese families do not speak the language at home, the children are hardly expose to the language in the early stage of their life. Some parents send their children to language enrichment classes, trying to expose them to the language, the result still do not match up to those who spend most of their time immerse in the Chinese speaking environment since young. 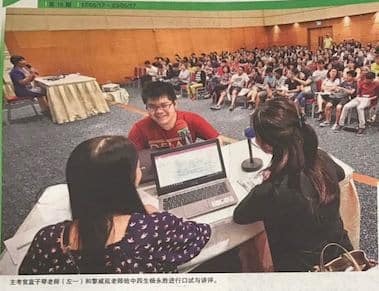 Due to the reality in Singapore, and the requirement to learn Chinese Language for all Chinese students, Singapore parents have been doing their parts to help their children to survive the subject. They send their children for tuition classes and enrichment classes, hoping to help their children to get by or, if possible, excel in the 10 years (for HCL students) or 11 years (for CL students) of Chinese language learning. The common thoughts about learning of Chinese Language is that, it is the same as learning any other subjects, that is, exposure! However, given that Chinese language is not the choice language for our Chinese students, they are not open to exposure. Parents send they children to tuition classes, hoping that the drilling in tuition classes will help their child “survive” the subject. Some think that memorising a few good sentences, paragraphs and even passages can help them do better in the essay writings. Sadly, all these can do little to boost the result when students enter to secondary school! Learning of Chinese language is not just memorising sentences and drilling on answering comprehension questions. Students need to know what needs to be learned, before they start memorising and drilling. As the MOE’s latest syllabus requires students to learning not only the language, but also the skills in using the language, the approach in teaching and the choice of materials will need to follow. We do hope to inculcate the Chinese culture and values to our students. However, we will be doing it by equipping our students with the necessary skills in learning, as well as to train our students in thinking critically. Besides helping students to learn the language, we emphasis in helping students learning how to learn. Both east and west have the same say of learning. “授人以鱼不如授人以渔”, which is exactly the same meaning as Maimonides’ quote: “Give a man a fish and you feed him for a day; teach a man to fish and you feed him for a lifetime.” Students must be able to know how to learn before they could learn. In secondary school, students are required to learn the language through learning how to use the language. Yes, it’s learning how to learn. It is a skill building and logical thinking training process. Students need to think critically when writing essays and answering comprehension questions. When students master these, they will be able to handle both essay writings and comprehension answering with ease. Need help in O Level Chinese Language and Higher Chinese Language? Call Loy LaoShi at 97690373 Now. If your are interested in learning more tips and tricks about learning Chinese and preparing to score well for exams, please read our blog here. Check out the testimonials of our students here. Learning Chinese language grammar. So… Chinese language has grammar?! What’s the difference between IP and non-IP for HCL?